Hi, Everyone! I'm Sonya from Beyond the Screen Door and I'm so very honored to be a part of Kim's Favorite Room series! Thank you, Kim, for the invite! 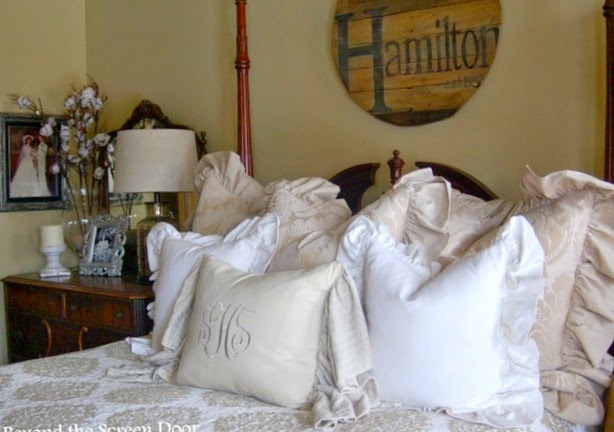 I began blogging 4 1/2 years ago as an extension of my interior design business, Sonya Hamilton Designs. While I have a degree in Interior Design and enjoy all aspects of home design my niche is working with fabric; window treatments, pillows, bedding, etc. Over the years this has allowed me to stay home while my children were small but remain creative and keep my hand in the business. As I thought over which room to feature, my master bedroom is currently the one room I feel is the most complete in representing my style and therefore...my favorite! In my home, no room is ever really complete. There's always something I'd like to tweak, paint, move, make, update or recycle. Knowing I wanted a neutral color scheme, when I came across this quilt at TJ Maxx several years ago I fell in love with the pattern as well as the color. I made the pillows and bed skirt to coordinate. The antique dresser belonged to my grandmother and was used as the altar in my oldest daughter's wedding. We have a wall of windows that looks out to the backyard. I love the amount of light that streams into this room. 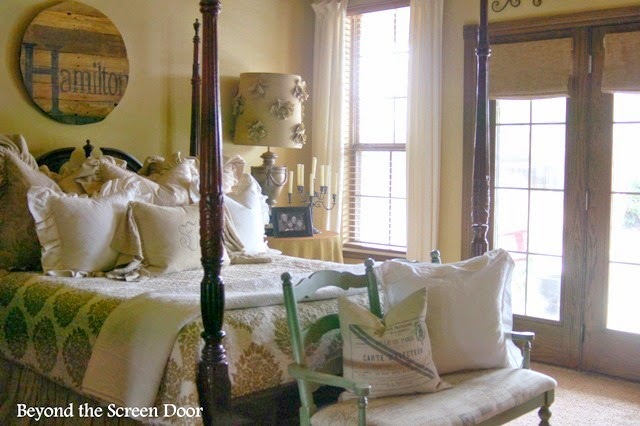 Simple ivory linen panels and caramel linen roman shades dress the windows & doors. The bench at the bottom of the bed sports more pillows and is painted a muted pale/green/aqua color called Shaded Cove and glazed. The walls are SW Whole Wheat. I found this huge old lamp at an estate sale, painted the base and recovered the shade with more linen and fabric flowers. This is one of my favorites. 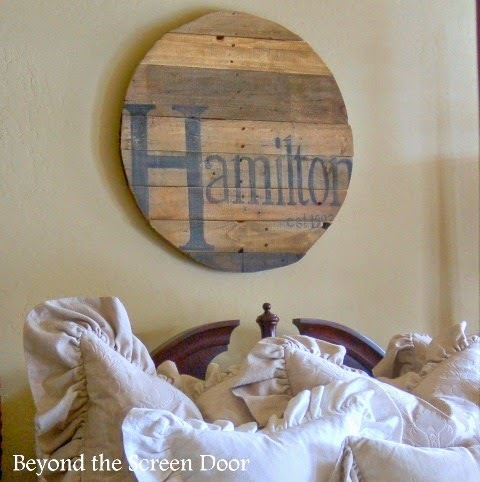 I couldn't find anything I liked to hang above the bed so my husband and I created this personalized repurposed wall art with pallets and paint. 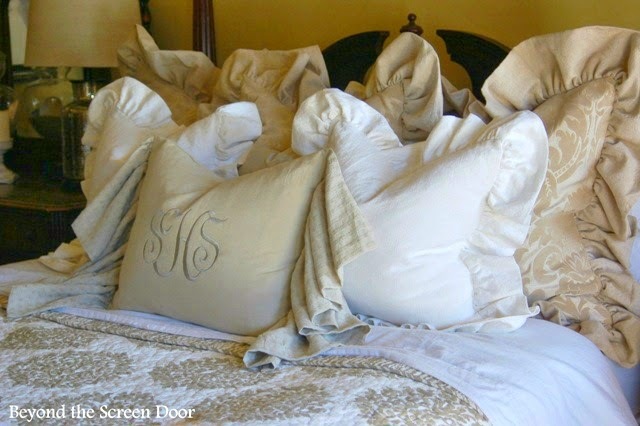 The pillows are made from a variety of fabrics in white and neutrals. I like ruffles. Can you tell? 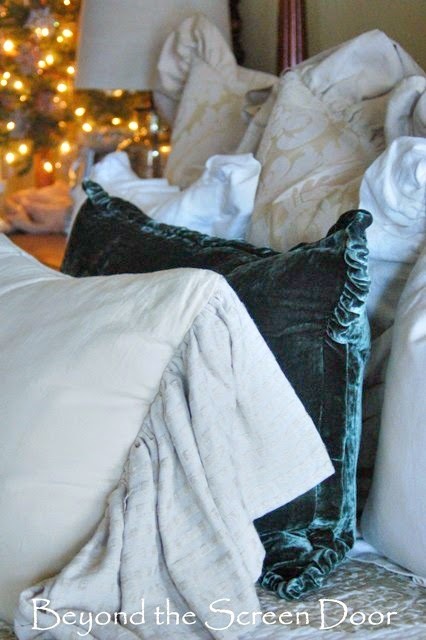 I don't change out my bedding for the seasons but I did make this smokey blue velvet pillow to add a bit of warmth and color to the bed during the winter months. I hope you've enjoyed this little tour of my master bedroom. Thank you, Kim, for inviting me to be a part of your favorite room series! Don't y'all love Sonya's beautiful bed with all those pillows? I sure wish I had the gift of sewing like that. Be sure to check out Beyond The Screen Door and she does custom work, too. Sonya, your bedroom is absolutely dreamy! What a gorgeous retreat! I adore you soft, feminine style! That lamp is my very very favorite! What a beauty! Thanks for sharing your bedroom and your gorgeous designs! Again, Kim you sure know how to pick the perfect bloggers! 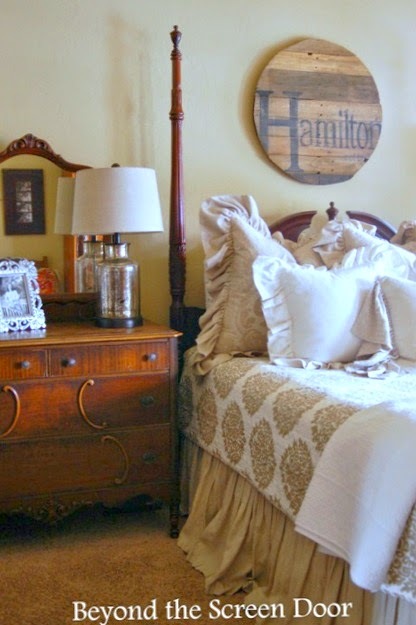 I've always loved Sonya's bedding...the whole room is beautiful!! LOVE that antique dresser! Sonya's bedroom is so beautiful, and she has created such a warm and lovely retreat with her bedding and beautiful pillows. What a luvly master retreat! The bed is so beautiful, and I luv the art above it. Just luvly Sonya. Such a beautiful room...love the bedding! What a beautiful room and I love all the layers. A bedroom for dreams. The lampshade is just perfect. I have always admired Sonya's gorgeous bedroom. She is so very talented in design and her wonderful drapery and pillow creations. She made a tree skirt for me and I love it!! Great feature Kim. Have a great weekend ladies!! Sonya's bedroom is beautiful. I love all her neutral colors. The round wood art is so unique...........great idea!! I couldn't be more thrilled to see Sonya and her blog featured. She is one talented lady and is one blog I have been following since my start. From the get go she's shown me support and friendship. Besides the sewing and fabric treatments I have enjoyed reading about and seeing her daughters wedding. Congrats Sonya, you're a talent!! Love that lamp!! Such great textures in that room. Beautiful job on all of it. Beautiful room! 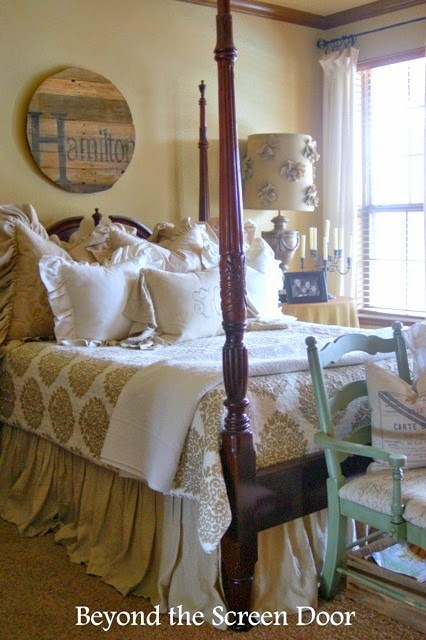 Love the candelabra on the nightstand! Thanks for sharing, Kim. Your bedroom is so pretty. I believe our bedrooms should be our sanctuary and peaceful. Your room is just that. I can see why it is your favorite room. Your new photo is fantastic and shows that your emphasis on a healthy lifestyle is working. You look great! Your bedroom is one of the prettiest I've ever seen on the internet. However, the sweetest part of this post to me, is that your daughter used your grandmother's dresser as an alter in her wedding. What a precious idea! I may have to store this idea away for my daughter. A beautiful, peaceful room! Sonya is such a pro with her creativity and sewing skills. 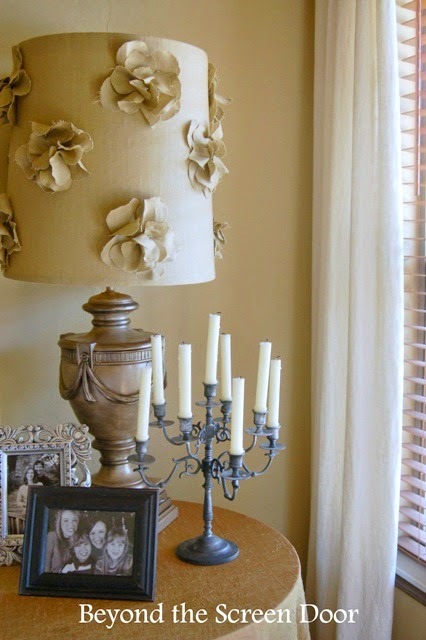 The lamp is one of my favorite items in the room, as well as the dresser. P.S. Kim, your new photo is just awesome!